Have you been searching for the best kids summer day camp in Astoria, Queens NY ? If you live in Astoria, Queens NY and you are looking for the best kids summer day camp for your children, then your search is over… you have come to the right place! 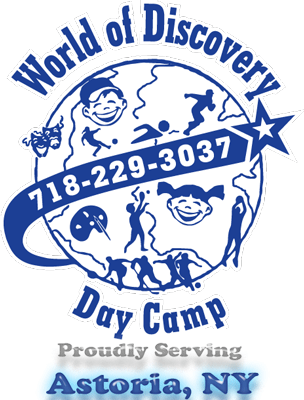 World of Discovery Day Camp of Bayside, Queens NY is the best kids summer day camp that offers summer day camp bus service in the Astoria community! It is true that World of Discovery Day Camp of Bayside, Queens NY is the best kids summer day camp in Astoria, and in all of Queens, NY! Please read below to find out some of the many reasons why are sure that you will agree that World of Discovery Day Camp is the best day camp for you and your children! World of Discovery Day Camp of Bayside, Queens NY proudly serves the families of the Astoria community and all neighborhoods of Queens. We have been offering the children of Queens, NY a quality summer day camp program for nearly 30 years! At World of Discovery Day Camp of Bayside, Queens NY, camp tuition includes prompt and courteous door-to-door pick up and drop off service right at your home or business in Astoria, Queens. When the Astoria summer day camp bus arrives at your doorstep each morning, your child will be greeted by the World of Discovery Day Camp bus counselors, escorted onto the bus and seat belted in. Upon your child’s arrival at our safe and fun summer day camp , the excitement begins! Your child will meet with his/her camp counselors and get introduced to fellow campers and Division Leader. Campers are grouped according to age and gender so that you can be sure that your child will be placed in groups of same gender campers who are just a few months apart in age. Our experienced summer day camp staff consists of several licensed teachers and also several licensed principals. World of Discovery Day Camp staff selects only the finest students from Queens high schools and colleges to supervise your children. Interestingly enough, many of our counselors have come up from the ranks as the majority of our counselors are alumni campers of World of Discovery Day Camp. At World of Discovery Day Camp our camper to counselor ratios are the best among best summer day camps in Queens – hands down! Campers at World of Discovery Day Camp of Bayside, Queens NY are in store for the best summer day camp experience ever at our wonderful campgrounds! World of Discovery Day Camp of Bayside, Queens NY is located among the beautiful, shady and cool John Golden ballfields at Crocheron Park in Bayside, Queens. At our clean, safe and exclusive campgrounds, campers will have the opportunity to participate in outdoor sports activities such as soccer, baseball, basketball, football, volleyball, tennis, dodgeball, kickball, circle games and much more! In addition, we have a full time arts and crafts program as well as an amazing science program for the campers to enjoy. At World of Discovery Day Camp of Bayside, Queens NY afternoons are jam-packed with specialty activities that include karate, dance classes, billiards, internet café, arts and crafts, sports instruction, magic shows, puppet shows, special events, color wars and many more kid-friendly activities! World of Discovery Day Camp swimmers enjoy the safety of our refreshing swimming pool. Under the watchful eye of our experienced staff of lifeguards, counselors, swim instructors and aquatics directors your child will receive all of the necessary tools to become a great swimmer. Campers who do not know how to swim when they arrive will leave with the confidence to make them more comfortable in the pool and some campers may actually learn how to swim. Campers who already know how to swim and advanced swimmers may take advantage of our diving boards as long as they pass our comprehensive deep-water test. Our pool is open exclusively to World of Discovery Day Camp campers and staff. World of Discovery Day Camp campers will get to take full advantage of the swim instruction program that is offered at no additional charge, they can swim recreationally – or they can spend their time equally between instructional swim and free swim time. Depending on their age, campers will go on 2-3 trips each week to the most amazing locations for kids that New York has to offer! Trips / trip locations are all age appropriate and plenty of fun! Trips for the campers over 10 years old include horseback riding, deep sea fishing, Dave & Busters, Adventureland, Speed Boat around Manhattan and many more! Campers under 10 years old go on several amazing trips including Little Chefs, LazerTag, Whitepost Farms, Ultimate Gaga and much more! World of Discovery Day Camp of Bayside, Queens NY has been offering the children of Astoria, Queens NY fantastic summer fun for nearly 30 years! For more information, please feel free to contact World of Discovery Day Camp of Bayside Queens at P.O. BOX 604010 • BAY TERRACE, NY 11360-4010 • 718-229-3037 • info@worldofdiscovery.org. 1 GREAT SUMMER! This entry was posted in Activities for Kids in Queens, Best Camp in Astoria, Choosing the Right Day Camp, Queens Swimming Pools, Swimming Pools Queens, Swimming Programs Queens, World of Discovery Day Camp of Bayside and tagged 1 great summer, 1GR8Summer, astoria day camp, astoria queens, astoria summer camp, bay terrace camp, bayside campgrounds, campers, Crocheron Park, john golden ballfields, kid-friendly activities, kids summer, magic sows, puppet shows, queens camps, sports, summer camp bus, summer day camp, swim instruction, swimming camp, Swimming pool bayside, swimming pools queens, teen camp, travel camp, trip camp, World of Discovery Day Camp. Bookmark the permalink.